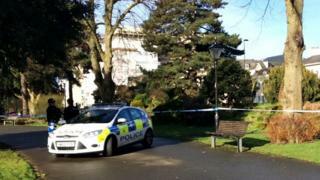 Two men and a woman have been arrested on suspicion of attempted murder after a man was stabbed in a park in Southampton. Police said the 35-year-old man, who is from the city, was stabbed in the back in East Park off Cumberland Place shortly before 20:00 GMT on Monday. He is in hospital in a stable condition. The arrested men, aged 23 and 24, and a woman, aged 23 are in custody, Hampshire Constabulary said. The force said part of the park would remain cordoned off while inquiries continued.